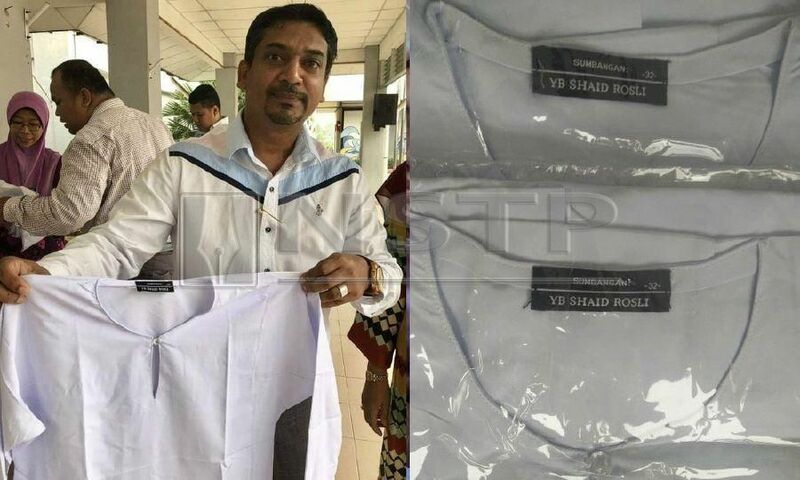 Jeram assemblyman Mohd Shaid Rosli (left) showing the school uniforms which bore the words ‘YB Shaid Rosli’ on the collar label. Pix courtesy of NST reader. SHAH ALAM: Jeram assemblyman Mohd Shaid Rosli, who previously made headlines when he donated schoolbags emblazoned with his image on them, has yet again become a topic of conversation with his latest donations. This time, the PKR assemblyman donated 10,000 school uniforms to primary school students within his constituency. All the uniforms bore the words ‘YB Shaid Rosli’ on the collar label. Mohd Shaid said the uniforms were a sincere contribution on his part to help students from underprivileged backgrounds. “These uniforms were specially designed with my name, ‘YB Shaid Rosli’ on the collar. “They were supposed to have been given out before the school session began but there was a delay from the distributor. “Alhamdulillah, this morning I was able to present the uniforms to the Sekolah Kebangsaan (SK) Puncak Alam 3, totaling 1,600 pieces. In total, we will be distributing 10,000 uniforms to all the schools in the constituency,” he said in a media statement. “Before this, my sincere contribution of schoolbags to students in the constituency became a polemic on social media. “The bags were given out to Tamil and Chinese school students in Jeram, meant to help ease the burden faced by their parents. “I understand that not everyone in the constituency is economically well-off. I hope that this contribution can reduce the burden of those from less fortunate families,” he said. Mohd Shaid’s schoolbags donation had previously been panned when pictures of the bags were widely cirvulated on social media. The public had criticised the move as a ‘publicity stunt’ and questioned the need to have his image on the bags if the donations were indeed sincere. He had previously dismissed the criticism, and said the bags were supposed to bear only a sketch of his likeness and not his actual picture.